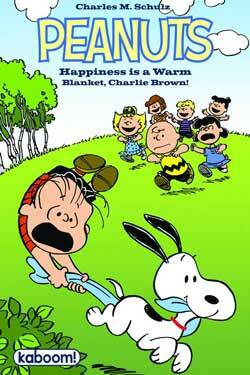 A few weeks ago, a new Peanuts animated special, Happiness is a Warm Blanket, Charlie Brown, came out on DVD. Adapted from a number of Charles Schulz’s Peanuts comic strips throughout its run, Happiness features Linus Van Pelt as he struggles to cope without his security blanket when his blanket-hating grandmother comes for a visit. The special was entertaining and well-made, evoking at it does an early-60s feel with its animation style and its character designs, but as I wrote in my review of the special, the story of Happiness is a Warm Blanket, Charlie Brown doesn’t feel especially ambitious because it doesn’t bring anything new to Peanuts that we haven’t seen before. BOOM! Studios adapted the story as a graphic novel. Not only does it launch their kaboom! imprint (a rebranding of their BOOM! Kids imprint), but it’s also the first-ever Peanuts graphic novel. In spite of my ambivalent appreciation for the special, I’ve been looking forward to the graphic novel, which just shipped to comic shops last week. Despite running about eighty pages, the graphic novel of Happiness is a Warm Blanket, Charlie Brown doesn’t cover the entire special. A few scenes, none of them vital, are excised, and the result is a graphic novel that moves a bit faster than the animated special. I still think the story is the weakest element of Happiness is a Warm Blanket — Linus, as much as I love him, isn’t really strong enough of a character to anchor a forty-minute animated special — but the graphic novel has a nice flow and a very interesting feel. Essentially, Happiness is a Warm Blanket, the graphic novel, reads like an alternate universe Peanuts where, instead of being a comic strip, Peanuts was a single-page gag comic book. On the DVD, there’s a documentary on how the script for the special was written, with Stephan Pastis and Craig Schulz going through fifty years of Peanuts and pulling comic strips together on the subject of Linus and his blanket to create a longer-form narrative. Recently, I purchased Celebrating Peanuts, and in going through that book I’ve found some of the exact comic strips that were utilized in creating the special. Each page of the graphic novel basically takes one or two comic strips and re-imagines them in comic book terms. Comparing a page of the graphic novel to one of the old comic strip provides an instructive lesson in how the form — a comic book page, versus a four-panel comic strip — shapes the material. What especially makes this work is the way that the artwork by pencillers Bob Scott and Vicki Scott and inker Ron Zorman evokes the feeling of Schulz’s artwork, circa 1961, which makes comparing the artistic approaches very easy. A four-panel strip of Linus and Snoopy wrestling with the blanket, resulting in the destruction of Snoopy’s doghouse, becomes a single page of the graphic novel, with a different perspective and a more open layout, keeping Schulz’s original story but making it fit the form. The end result of the graphic novel, I think, is actually quite admirable, much like a jazz improvisation on a familiar tune highlights some aspects of the tune but also brings new elements to the fore. The graphic novel of Happiness is a Warm Blanket, Charlie Brown, I dare say, may be the most creative way to experience the story. As I mentioned in my review of the DVD, the story is very much a pastiche of a Peanuts special. It doesn’t do anything that hasn’t been done before in animation, and the story, coming as it does from old comic strips, feels very familiar. The graphic novel, by contrast, brings something new to the familiar material by bringing it into a form — a full-length graphic novel — that Peanuts hasn’t been in before, giving something familiar a new interpretation. I don’t know what BOOM! has planned for Peanuts‘ future. Perhaps an adaptation of the next Peanuts special, based on the World War I Flying Ace comic strips. Perhaps even a collection of the Peanuts comic books published by Dell in the 1960s. Based on the quality of the graphic novel of Happiness is a Warm Blanket, Charlie Brown, I think Peanuts fans will feel they are in safe hands with BOOM!, and I can’t wait to see what comes next.